Lionel Neykov isn’t afraid to wear his heart on his sleeve. Even when that sleeve is brushing against the wood grain of his acoustic guitar and his voice is drawing outlines around that visible heart. And it’s that voice which will draw people to Neykov’s music, although I can't pinpoint just who he reminds me of, so I'll leave it at this: I was extremely impressed by that voice. And yeah, although indie is what I like and Neykov and his music has a major label feel (albeit an indie sound), I can’t ignore the pure talent that Neykov possesses vocally. I have never been contacted by an unsigned artist, whom, after listening for less than five minutes, I could predict would be picked up by a major label. The music is kind of like Ray Lamontagne’s rawness if leavened by the dry ache of two of Neykov's stated influences, Brits' David Gray and Damien Rice. 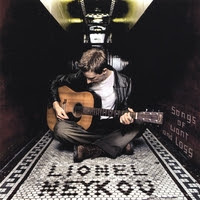 For the most part it’s simply Neykov with his guitar and voice on his first effort, Songs of Want and Loss, which he has released himself via the internet. MP3 Links Expired - BUT I've put these songs in a mix you can find here. Stream four songs on his myspace page – be sure to listen to “Hey Ruth”.